We are an exclusive Latin American dance show and dancing school in Prague. We bring you the best of the art originating from the roots and traditions of Latin America. The creative artist and head of the dance group LatinArte is a talented and accomplished Cuban dancer, choreographer and dance teacher Hanser Raúl Estenoz Verdecia, who worked for many years in the renowned Havana Cabaret Tropicana of Cuba. After previous engagements in Brazil and Senegal he is now based in Prague, where he founded the artistic group LatinArte, which offers Latin American dancing and music performances, as well as lessons of Classic and latin American dance. In his performances he works with professional dancers from Cuba, Brazil an the Czech Republic with original costumes designed and sewn by the famous Cuban fashion designer Reynaldo Romariz. 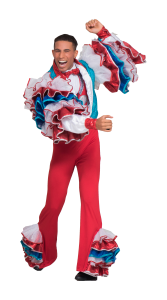 Presently he teaches Latin American dance at the Royal Spanish Institute Cervantes in Prague, he also offers shows/programmes for private and corporate clientele. The dancing programme and performance is always adapted to the wishes of the client, when it comes to the selection of dances, music and interactions with the audience. LatinArte offers a unique, stunning and unforgettable experience. Not only is it a production of high artistic value, but also a moment where you can enjoy dance magic, which is able to transport you, if only briefly, into the world of Caribbean rhytm, sun, smiles and enjoyment.